You are here: Home › What’s new › Brewing Smoke › Ammo for the Pipe smoker – Spent shells put to good use. If you are near Binghamton or Ithaca Sunday, December 9, be sure to stop by the Waterman’s Distillery 6172 Route 434, Apalachin, NY 13732 between Noon and 4:00 PM. The Pipeshoppe.com table will have a variety of pipes for sale. Up here in rural Tioga County, NY hunting season affords one the luxury of taking pot shots at all the neighbors who have given offense during the off-season. Maybe you suspect they voted for the wrong party, or they leave their trash out longer than necessary and attract various rodents and black bears and all sorts of problems, or just because they like country music, just not the kind you like. Whatever the reason, hunting season tends to be a free-for-all in this neck of the woods. By early December I have a pile of spent cartridges lying around collecting rust. That is until this year. Ken Brewster has shipped his shell casings off to his friend Tim at Mitllah Manufacturing down in Upstate Pennsylvania where they are magically transformed into non-lethal pipe tampers and scrapers. These handy pipe tools are now available exclusively at Pipeshoppe.com. We have been told that these pipe tools will not discharge the stainless steel scraper into your ceiling while tamping a lit pipe. If it does, however, send up a photo so we can show just how terrific these projectiles are. We will not cover the cost of repairing your ceiling or the nose surgery if the scraper goes sideways, but we will definitely post the photograph. 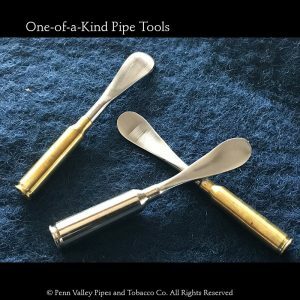 If you are looking for an unusual gift for the deer hunter or the dear pipe smoker, these pipe tools will definitely make a good impression. Buy some for the kids to shoot off on New Year’s Eve and the 4th of July.